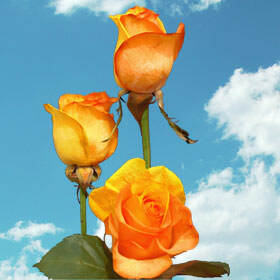 The soft yellow and orange hues radiating from these Cheap Rainbow Roses poise elegance. A splendor of incandescent tones displayed on each petal subtly interfuse with one another to comprise an array of eye-pleasing blossoms. These two-toned yellow and orange buds are created through a special dying technique, resulting in blossoms that possess a simplicity that is not only beautiful, but tasteful. A bouquet of these florets is exemplary for adding a touch of charm to an intimate dinner party at little cost. They're ideal for both fall and summer weddings, as the yellow and orange blossoms will flawlessly compliment the colored leaves in the fall, and the flourishing vegetation in the summer. Our Cheap Rainbow Roses are truly too exquisite to be admired only during special events, so why not remind that classy women in your life just how much you adore her with a "just because" bouquet? 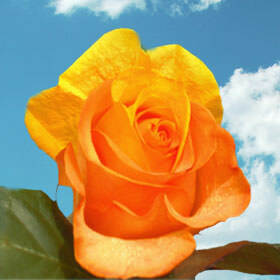 GlobalRose.com sells at prices usually lower than most local wholesalers. Our cutting-edge facilities allow USA to grow year round, so we can offer you cheap prices on the products you desire, whenever you wish. We pride ourselves in our reputation of providing the freshest florets possible, which is why we cut your blossoms especially for you, your loved one, or special event just a few days before they arrive at your door. All of our products take just 3-4 days to deliver, so please be sure to place your order accordingly. Also, please note that color tone for may vary due to monitor screen, and of course, Mother Nature.